VA 14 from the West Virginia line to Lexington. VA 33 from Lexington to Natural Bridge. VA 141 from Natural Bridge to Natural Bridge Station. VA 14 from Natural Bridge Station to Lynchburg. VA 10 from Lynchburg to Burkeville. VA 20 from Burkeville to Richmond. VA 39 from Richmond to Newport News. Here is a more detailed look at the history of US 60 from a geographic standpoint. US 60 initially entered Virginia at today's VA 311's northernmost crossing near I-64. It followed today's VA 311 to Crows, then turned northeast on today's VA 159. Here, US 60 followed an older alignment of this road, much of which survives as access driveways to people's houses, complete with old small bridges over streams. About halfway up VA 159, it appears US 60 followed today's VA 159 more directly. Just past SR 661, US 60 originally veered east on today's SR 710 to cross Dunlap Creek. I-64 cuts off the original route today, but US 60 then picked up today's US 60 just east of Exit 10. US 60 followed today's US 60 to Covington but used the Humpback Covered Bridge and used today's SR 645 through Teaberry Flats. US 60 entered Covington on Bridge St, then turned south on VA 154 Water St, then east on Lexington St, then north on Chestnut St, then east on Highland St over to today's US 60-220. Original US 60 followed US 60-220 east out of Covington, then followed SR 1104 paralleling the north side of I-64. 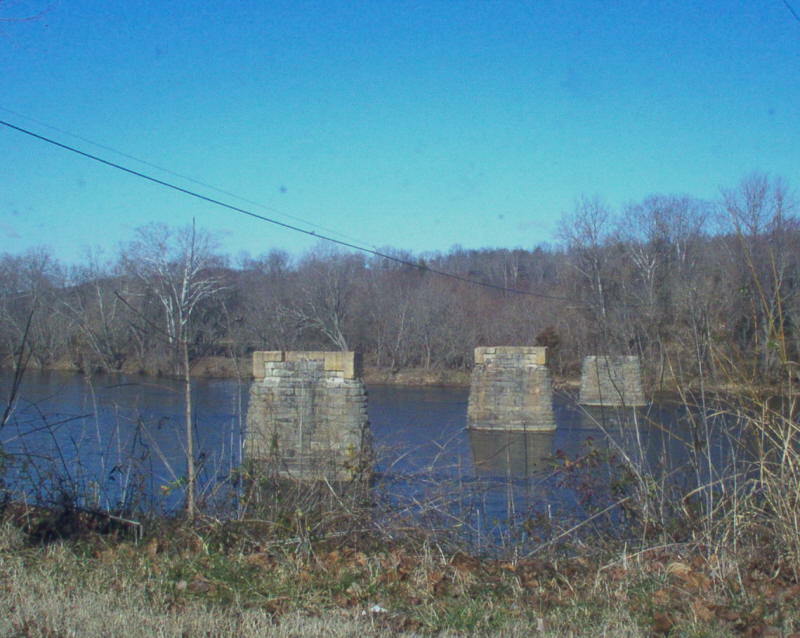 About where I-64 crosses the Jackson River east of Covington, US 60 used to cross the river and parallel the railroad tracks - this alignment is now part of I-64's footprint. Original US 60 leaves this footprint just west of Low Moor, using Kams Rd (frontage road south of I-64) and SR 696 through Low Moor and Selma. Original US 60 picked up US 60-220 Business heading into Clifton Forge, using the east bound one-way split on Ridgeway as the two-way route. East of town, US 60 veered north on Ingalls Dr then east on SR 662 Chesnut over toward the east end of US 60 Bus, then picked up SR 632 Longdale Furnace Rd. US 60 used today's VA 269, then SR 850 over the mountain and through Denmark. At Kerrs Creek it picked up today's US 60 all the way into Lexington. Adjustments:In 1928, US 60 was removed from the James River and Kanahwa Turnpike through Teaberry Flats, leaving behind CR 236 (today's SR 645). Also, based on bridge dates, US 60 was straightened out on today's VA 159. 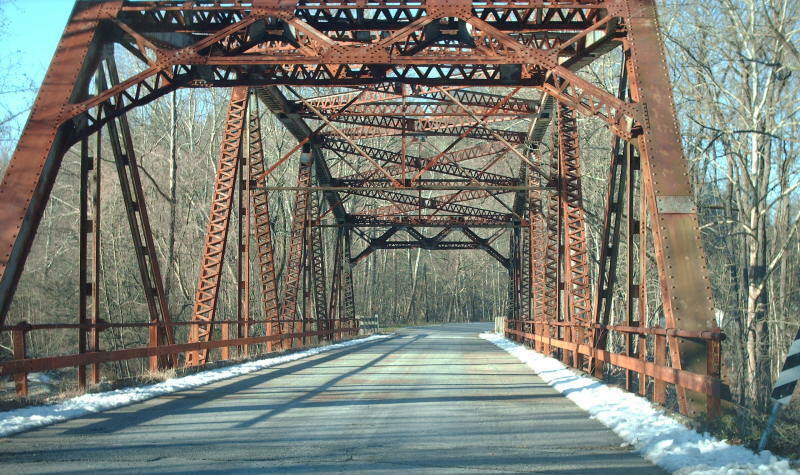 In 1929, US 60 was removed from the Humpback Bridge. It is unclear when US 60 was rerouted to its current path through Covington. The Covington inset disappeared from state officials beginning in 1933. 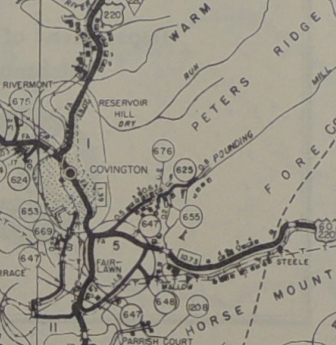 The 1936 Alleghany County Map is a little vague but seems to show a direct path through town. In Oct 1947 (CTB), US 60 was rerouted west of Callaghan to run directly west to White Sulphur Springs, WV. This was a renumbering of US 60 ALT. The old path through Crows became VA 159 and an extended VA 311. Between 1945-49, US 60-220 was placed on new alignment east of VA 18, leaving behind SR 689 (now cut off by I-64...today it is a little stub E. Echols Rd; SR 689/647 Interstate Dr; destroyed by 64 on the eastern end). About 1953, US 60 was put on what is now I-64's footprint bypassing Low Moor and Selma, leaving behind SR 696. In 1965, US 60-220 was removed from SR 1104 Valley Ridge Rd east of Covington and placed onto the new I-64. 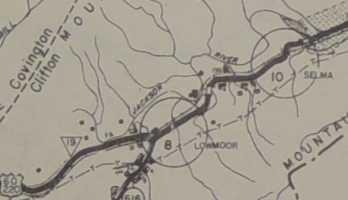 Note that US 60-220 always crossed the Jackson River essentially where I-64 does now, and not where SR 1101 Winterberry Ave does by Alleghany High School. I-64 was built directly on top of US 60-220 from the Jackson River bridge east to the US 60-220 Bus/VA 384 exit west of Clifton Forge. In July 1967 (CTB), US 60 was placed on the new I-64 from the West Virginia Line to Exit 7. Some segments of the old route 60 not directly on the interstate's footpath are part of F-046. In Aug 1967 (CTB), US 60 was placed on the new I-64 from Exit 7 to Exit 10. This left behind some SR 661, a tiny bit pf VA 159 and SR 710. About 1972, US 60 was placed on the new I-64 bypassing Clifton Forge. The old route through town became US 60 Business. About 1980, US 60 was added to new I-64 between today's US 60 Business east of Clifton Forge and VA 42. This left behind SR 632. Jan 1984 (CTB), US 60 was added to I-64 from VA 42 to Kerrs Creek, leaving behind today's VA 269 and a lengthy SR 850. I-64 had been opened a couple years already. US 60 historically used its current route from the west along Nelson St. then south on Main St joining US 11/VA 33. US 11-60 followed Main St south to Thornhill Rd to VA 251. In July 1933, US 60 was rerouted to go north on Main St with US 11, then east on Washington St. In Aug 1939, (CTB) the duplex with US 11 was removed altogether and US 60 was a straight shot through town as it is today. US 11-60 initially used VA 251 south to SR 764 then cut southeast back to today's US 11. The route followed today's US 11 to below the current Fancy Hill exit with I-81, then veered southwest on today's SR 609 then over SR 743 back towards modern US 11. The original US 11-60 used SR 743 which hugs US 11 closely down to near Natural Bridge where the route picked back up modern US 11. US 60 split from US 11 by using today's VA 130 east. US 60 initially used today's SR 773 Lloyd Tolley Rd through Natural Bridge Station, and then today's VA 130 to Glasgow. US 60 then followed today's US 501 over the mountain and over the dam crossing the James River. It appears that US 60 followed today's modern US 501 through Big Island to Boonsboro, but likely used Winding Creek Ln north of Boonsboro. US 60 followed today's US 501 Business until it cuts south on Langhorne Rd, and continued into Lynchburg on Rivermont Ave. Adjustments: In August 1928, the state designation with US 60 from Natural Bridge to VA 14 (now SR 608) was renumbered from VA 141 to VA 801. 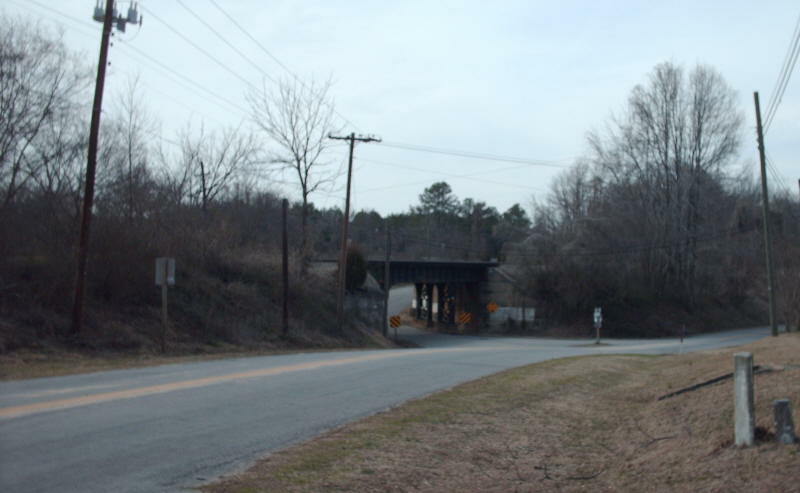 In 1930, US 60 was removed from Natural Bridge Station and placed on what is the current VA 130 through the area, leaving behind CR 110. By 1932, US 60 was placed on the current US 501 near Boonsboro. In July 1933, US 60 was removed from the Lexington-Lynchburg corridor, leaving behind US 11 from Lexington to Natural Bridge; VA 249 Natural Bridge to Glasgow; US 501 Glasgow to Lynchburg. US 60 followed Rivermont to downtown, which turns into Main St. US 60 continued down Main to Pine St where it cut east (not possible now), then southeast via Lynch St and Garnet St to Concord Turnpike. US 60 followed Concord Turnpike east out of town to today's Old Richmond Hwy. About 1929, US 60 was rerouted to cut south from Main St onto 12th St then southeast on Campbell Ave to today's US 460 Business. US 60 then headed out of Lynchburg on today's US 460. 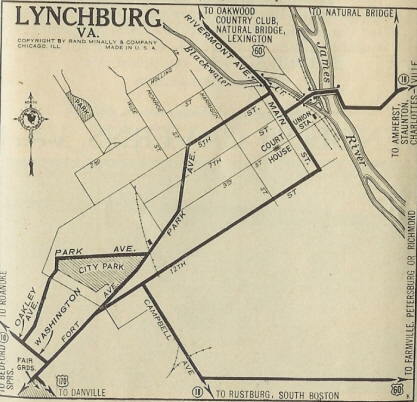 In July 1933, US 60 through Lynchburg was renumbered as US 501. US 60 original Lynchburg routing. US 60 followed US 29-460 east out to Old Richmond Hwy then east (now cut off by the new US 29 freeway) back to US 460. US 60 followed modern US 460 until nearly Concord, then used SR 800 through that community. US 60 picked back up US 460 over to Appomattox, except it used SR 689 through Spout Spring. US 60 appears to have followed US 460 Business through Appomattox although it used SR 1004 in the SR 727 junction area. 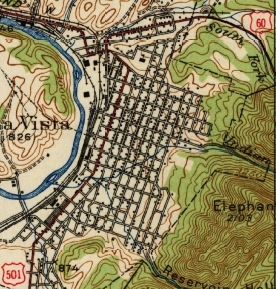 US 60 may have briefly used the original VA 10 routing that very closely followed the railroad through Evergreen and most of the way to Pamplin. US 60 used US 460 Business through Pamplin. US 60 then followed US 460 east of Pamplin. US 60 -may- have used SR 655-628-608 in the Prospect area but quit doing so by 1928 if it did. Approaching Farmville, US 60 used the lengthy SR 695. Through Farmville itself US 60 followed today's US 460 Business. US 60 followed US 460 east of Farmville, then dipped south on today's SR 600 through Rice, then southeast on SR 735 to modern US 460. US 60 followed US 460 to Burkeville except it used the SR 736 loop. At Burkeville, US 60 used SR 716 Namozine St (partly cutoff from US 360-460 now), then US 360 Business 2nd St. US 60 followed today's US 360 corridor northeast from Burkeville (a few bits of old alignment are visible from the 4-lane alignment today). US 60 used SR 671 through Jetersville and SR 697 through Maplewood but otherwise US 360. Approaching Amelia, US 60 veered north on SR 656 S. Amelia Ave and used that to Amelia CH. US 60 picked up today's US 360 Business heading east from Amelia CH. It continued on Goodes Bridge Rd past US 360 which loops back around to US 360. US 60 used US 360 east to Chesterfield County except at SR 604 it used Mt. Olive Ln and near VA 153 it used SR 698 Circle Dr. Adjustments: About 1932, US 60 bypassed Rice by using today's US 460 to SR 735. This left behind CR 10. Also about 1932, US 60 was placed on modern US 360 through Chesterfield County, leaving behind CR 241 and CR 244. In July 1933, the Lynchburg to Burkeville segment became part of US 460 and the Burkeville to Richmond segment became part of US 360. In July 1933, US 60 headed east out of Lexington and used its current routing to Buena Vista. However, at the then-WCL of Buena Vista, US 60 used Orchard St which curls around to the south before the railroad and no longer crosses the small stream. US 60 continued south on Alleghany, then east on Factory to Beech, then north to 29th before heading east on current US 60. US 501 actually began at the Factory-Beech intersection. Most of this was a renumbering of part of VA 14 although some was shown on the 1932 Rockbridge County map as not yet present. US 60 followed its current routing over the mountain into Amherst County, which was either a renumbering of a briefly rerouted VA 13 or new construction altogether to SR 605. East of here US 60 was replacing VA 13 all the way to Richmond. 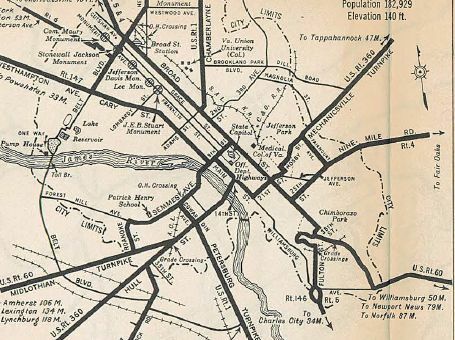 US 60's routing was the same in July 1933 as today through Amherst and over to Bent Creek. Just west of the James River it used SR 819 Caskie Dr to the original bridge (piers still standing), then SR 717 on the Bent Creek side of the river. US 60's 1933 route used today's US 60 through Buckingham CH but used SR 690 from the Lee Wayside over to the Sprouses Corner area. US 60 then picked back up modern US 60 to Cumberland CH except it used the SR 619 loop east of VA 45. East of Cumberland CH, US 60 followed today's VA 13 through Tobaccoville and over to Powhatan CH, except modern US 60 clips the original routing a little west of the courthouse. US 60 followed VA 13 to its end with US 60 in Plain View then followed the loops of SR 653, 679, 678, 676 and 675 along the modern US 60 corridor to Chesterfield County. It appears the 1933 routing of US 60 in Chesterfield County used today's US 60 all the way to Richmond except at the VA 161 area it used "Old Midlothian Tpk". Adjustments:By 1936, US 60 was placed on its modern alignment between Cumberland CH and Chesterfield County. This left behind VA 13 and all the SR 67x loops (initially some of these were extensions of 61x and 63x routes). Note that the new construction between Cumberland CH and SR 684 near Powhatan CH was briefly VA 284 during the construction phase first. 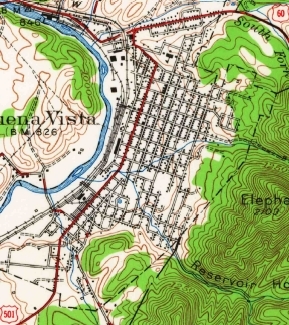 In Dec 1938 (CTB), US 60 was placed on its current Buena Vista routing. Between 1942-44, US 60 was straightened out between Buckingham CH and US 15 leaving behind SR 690. In 1955, US 60 was placed on its current routing through the VA 161 interchange. Before 1958 US 60-VA 45 was put on its modern alignment leaving behind SR 616 west of Buckingham CH. In 1965, US 60 was put on its modern crossing of the James River leaving behind SRs 717 and 819. Originally, US 60 came in on Hull St then joined US 1 on Cowardin Ave to Semmes Ave to the bridge at 9th St. US 60 followed 9th St to Broad St then east to 36th St, south to Government Rd east out of town. In 1931, US 60 was rerouted to follow Hull all the way to the 14th St bridge, as US 360 does today. Then US 60 turned east on Main, then north on 21st to Broad then east as it did before. In July 1933, US 60 was removed from Hull (renumbered as US 360) and instead came in along Midlothian Turnpike (replacing VA 13). It appears US 60 used its current Roanoke St to Semmes Ave to a bridge at 9th St which it followed to Broad, then east as before. In Aug 1935 (CTB), US 60 was moved to used 2nd St between US 1 and Broad. In Oct 1950 (CTB), US 60 was split onto one-way routings: EB used 2nd to Broad as before, but WB used Broad to 1st, then south to Cary then east to 2nd before heading south to US 1. In Nov 1953 (CTB), US 60's one-way splits were changed. EB still just used 2nd to Broad. EB left broad at 11th, went north 2 blocks to Clay St, then west to 1st St which it followed south as it had since 1950. In April 1955 (CTB), EB used Cary to 3rd St north to Broad. WB was changed to leave Clay St at 2nd St instead of 1st. 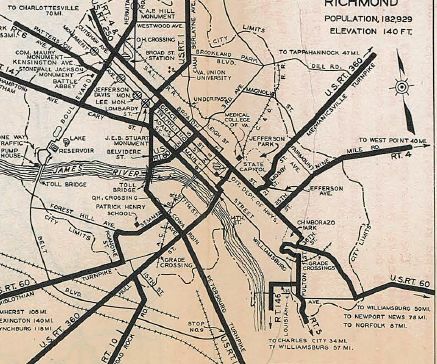 The Sept 1959 CTB minutes imply US 60 was returned to run both ways on 2nd to Broad as it had prior to 1950 (there was an explicit description of all Richmond primary routes). The description of VA 33 implies only Broad St as its routing. However, there is no mention of Clay St to city street status, as it explicitly mentions happens to Belvidere St when US 1 left it at that time). Thus, I believe US 60's routing did not actually change given the March 1962 change below. Although there is room to do so, no official map in the 1950s-1970s showed any of the re-routings of US 60. In March 1962 (CTB), US 60 westbound was rerouted to leave Broad at 9th instead of 11th north to Clay, as the new Civic Center opened, closing part of Clay Street. 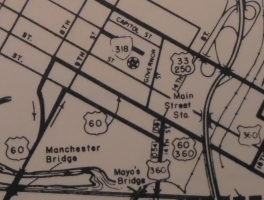 In June 1974 (CTB), US 60 was moved onto the Manchester Bridge as it is today. US 60 then split into one-way routings: EB using 9th and Cary and 14th to Main St which US 60 followed east to 21st, then north to Broad. WB used Main from 21st to 8th St.Broad St from 2nd to 18th became an extended US 33-250 in the process. US 60 was also split into a one-way setup on Broad and 21st: EB used 21st to Broad. WB used 23rd north to Marshall then west to 21st south across Broad. In Sept 2003 (CTB), US 60 was rerouted to avoid Broad St altogether by staying on Main St east all the way to Williamsburg Rd, then east on Stoney Run Dr to connect with Government Rd, reconnecting to US 60's historical east exit of Richmond. Broad St was turned into a minor neighborhood street with numerous 4-way stops. Initially, US 60 followed modern US 60 to Sandston, then "Old Williamsburg Rd" east (cut off by I-295 now) which runs to Bottoms Bridge. The US 60 followed its current routing to the Roxbury area where it picked up SR 631 (no longer exists west of VA 106) for a while. US 60 picked back up its current routing, then used SR 629 through Providence Forge. It is unclear if it ever used the SR 629 piece that runs north of present US 60. US 60 followed modern 60 east, then used SR 649 through Walkers to Lanexa. US 60 picked up its current route here and used it over to VA 30 except at Edwards Swamp where it used "Old Route 60". US 60 followed modern 60 through Norge and Lightfoot approaching Williamsburg. US 60 was placed on its modern alignment from VA 33-249 to VA 30 about 1947. 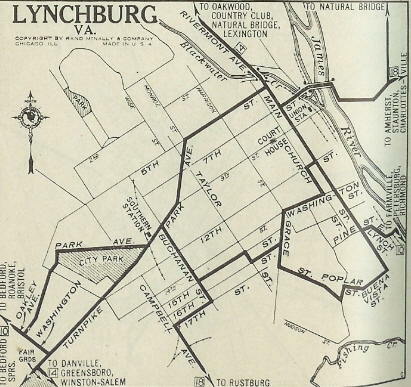 US 60 initially used Richmond Rd (old VA 162 endpoint) straight to central Williamsburg, then Duke of Gloucester St east then south around the Old Capitol using Blair, Francis and Waller Sts to York St east out of town. In Dec 1934 (CTB), US 60 was placed on its current bypass of Williamsburg, as new construction that began as VA 39-A in 1931. The old route into town became US 60-Z. Today only a small piece on its eastern end is primary, part of VA 5. US 60 followed its current route east of Williamsburg down to the Denbigh area of Newport News. 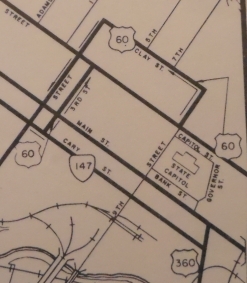 Originally, US 60 used Old Courthouse Way at VA 173, then Campbell Rd on the east side of modern 60. It is unclear if original US 60 used today's Smucker Rd (no longer forms a complete loop if it ever did), but it did use Mitchell Point Rd and Nettles Rd on the east side of today's US 60. It appears from the south end of Nettles, original 60 followed today's 60 down Warwick Blvd to 64th St where it cut west to Huntington, then south to 50th, west to Washington Ave, then south to 25th. 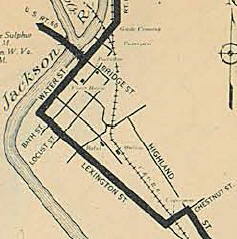 US 60 used 25th east to Jefferson Ave which it followed south to end at the ferry to Norfolk. By 1929, US 60 appears to have been routed to use today's Warwick south of present US 17-258 all the way to 25th instead of zig-zagging around. In 1930, US 60 was rerouted away from the ferry landing on Jefferson and instead headed south on today's Warwick Blvd east on 25th, turning into Kecoughtan Rd. Near Hampton, US 60 zig-zagged on Jackson St (now Kecoughtan), Victoria Ave (now Settlers Landing) and Armistead Ave then east on Queen St which crossed the Hampton River. US 60 then picked up E Queen St south to Tyler St which ran east to today's VA 143 which US 60 followed to Phoebus, but contined on County St and Water St down to Mill Creek. US 60 then used VA 143's approach to Fort Monroe, then used Ingalls Rd through Fort MOnroe down to the ferry landing at Old Point Comfort. About 1944, US 60 was rerouted on Fort Monroe to use McNair instead of Ingalls, following the edge of the island to the ferry landing. In 1957, US 60 was put on existing VA 168 (now I-64) to cross the new Hampton Roads Bridge-Tunnel. The old route through Phoebus to Fort Monroe became part of an extended VA 143. In Aug 1957 (CTB), US 60 was split into one-way routings in central Hampton. EB stayed as before. WB left Queen using Eaton north to Lincoln west to Armistead south to Queen. In Sept. 1961 (CTB), US 60 was rerouted in downtown Newport News to use 25th St west to Warwick Blvd north. This replaced US 60 ALT. Sometime before 1963, US 60 was placed on one-way splits using 25th and 26th Streets from Warwick east to Buxton Ave.
About 1974, US 60 was placed on one-way splits between 50th and 71st Sts. US 60 WB continued to use Warwick Blvd. US 60 EB used Huntington Ave to 50th St. The US 60 EB routing was a renumbering of US 60-Y. It apprears that US 60 may have been placed on one-way splits all the way down to 25th-26th Sts. Maps do not show either set of one-way splits in Newport News. About 1975, US 60 was placed on the modern Warwick Blvd (new construction) in the Denbigh area southward, leaving behind Old Courthouse Way, then Campbell Rd, Mitchell Point Rd and Nettles Rd. In Jan 1979 (CTB), US 60 was removed from Queen St in Hampton and instead put on Settlers Landing Rd. The Armistead Ave piece of US 60 became an extended VA 134. Queen St became a mall. Since I can find no other CTB reference, I assume this is when the one-way split involving Eaton and Lincoln Streets went away. When I-664 was extended south to the Monitor-Merrimac Tunnel in the early 1990s, US 60 was reconfigured to make way for the ramps everywhere. This caused US 60 to have a unique configuration where it duplexes with itself - US 60 WB crosses over I-664 then turns left on US 60 EB to curl back around under US 60 WB's bridge over I-664 to reume its path on Warwick Ave. This routing is not shown in the traffic logs. 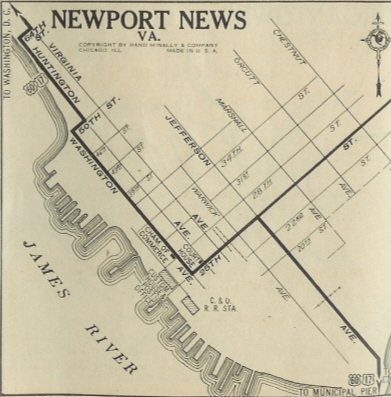 In 1929, US 60 reached Norfolk via ferry to what is now Norfolk Naval Base, then headed down with VA 27 on Hampton Blvd. US 60 then cut over on 21st St to Colonial Ave south to Princess Anne Rd where it picked up US 117 and headed east to pick up Virginia Beach Blvd. US 60 then followed Virginia Beach Blvd all the way to the oceanfront, ending at VA 101 Atlantic Ave. In March 1930, US 60 was removed from downtown Norfolk altogether and instead entered Norfolk via ferry at Ocean View on Willoughby Spit. US 60 followed Ocean View Blvd, picking up modern US 60 after 4th View. US 60 appears to have followed its current routing essentially all the way to Seashore State Park, where it then continued to followed old VA 305 through Cape Henry and around to the north end of Atlantic Ave. US 60 followed Atlantic Ave to end at US 117 Virginia Beach Blvd/17th St. In July 1933, US 60 was extended south on Atlantic Ave across Rudee Inlet onto today's S. Atlantic Ave to end at Camp Pendleton, replacing a piece of VA 12. US 60 through Norfolk and on Virginia Beach Blvd. 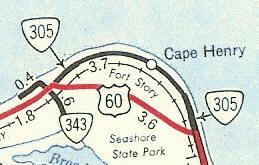 In August 1941 (CTB), US 60 was placed on its current routing bypassing Cape Henry and Fort Story, leaving behind VA 305 (not numbered officially today). The east end of US 60 gets murky after 1941. The 1938 and 1941 CTB referred to problems with the Rudee Inlet Bridge. A 1952 photo from the Virginian Pilot newspaper shows this bridge gone, as does the 1948 topo map of this area. What appears to have happened is that the original bridge was torn down (there were other bridges slightly west for people to use, including one that was east of the current set of bridges). My educated guess (based on what is true regarding VA 92 and VA 125 today) is that US 60 on paper continued to end at Camp Pendleton while functionally ending at Rudee Inlet with the idea that someday the bridge would be replaced. It is currently not known if there was detour US 60 signage over then-SR 671 or whatever. In May 1958 (CTB), US 60 was rerouted onto Pacific Ave from 44th Ave southward to 17th Av then east back to Atlantic. Pacific Ave was a lot of new construction and it had originally been envisioned to make this one-way splits with Atlantic and Pacific. Atlantic Ave from 44th to 17th became US 60 Business (not numbered today). In Feb 1961 (CTB), US 60 was formally removed from the long-demolished Rudee Inlet Bridge, leaving a discontinuous piece south of the inlet. In Sept 1961 (CTB), the piece of US 60 below Rudee Inlet was decommissioned to SR 601 (see scan under US 60 Business) and US 60 ended at the Atlantic Ave turnaround at 2nd Ave, where it officially still ends today. Around 1992, US 60 was removed from Ocean View west of 4th View and instead was sent on 4th View to I-64 to get to the Hampton Roads Bridge-Tunnel. US 60 in Ocean View undewent a slight change in July 2004: WB US 60 traffic wishing to get onto 4th View St and on to I-64 (and US 60 West) must turn left onto Mason Creek Rd (via a new traffic signal), then make a right turn from Mason Creek onto Tidewater Dr, and then on to 4th View. There is no longer a direct connection/turn from WB Ocean View onto 4th View. Furthermore, the city made it to where traffic coming up Tidewater Dr can no longer directly continue onto WB Ocean View...they can only turn left onto 4th View. Traffic on Tidewater wanting to take Ocean View onto the Willoughby Spit must use Mason Creek Rd to make the connection. Also about 2004, a US 60 END shield appeared on General Booth Blvd at Rudee Point Rd just south of the Rudee Inlet bridge. So the City of Virginia Beach may have rerouted US 60 onto Pacific south of US 58 Business. Of course there are zero postings at US 58 Business. On the flip side, as of 2016 all official VDOT sources continue to show US 60 using Atlantic to the inlet. In 1931, US 60 was paved from Natural Bridge Station to Glasgow. In 1932, all remaining segments were paved: Appomattox to Farmville; SR 696 to Burkeville and Richmond; Bottoms Bridge to Providence Forge. 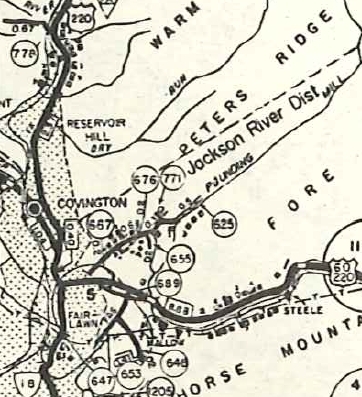 The 1933 Official shows the new US 60 routing from Lexington to Richmond as paved. The earliest multilaning of US 60 apparently is its US 1 duplex south of the James River which is shown as multilaned on a 1937 Texaco Map by 1941 it was multilaned between Newport News and Fort Monroe. In 1947 (bridge dates) US 60 was 4-laned from Bottoms Bridge to VA 30. By 1947, US 60 was also multilaned from eastern Ocean View to Pleasure House Rd. In 1951, US 60 was multilaned: Covington east half way to Low Moor; south end of the Norfolk Ferry to the section widened in 1947; the Atlantic Ave portion of the route in Virginia Beach; oddly the piece from Diamond Springs Rd to Pleasure House Rd reverted to 2-lane on official maps. In 1953, US 60 was multilaned from VA 152 south to Huntington Ave. 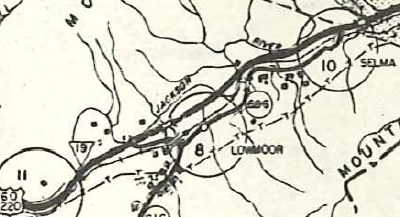 In 1954, US 60 was multilaned on the new Low Moor-Selma Bypass. In 1955, US 60 was multilaned from just east of VA 161 to about 2 miles west of 161; US 60 was multilaned into Clifton Forge. In 1956, the VA 161 area widening was extended most of the way to VA 147. 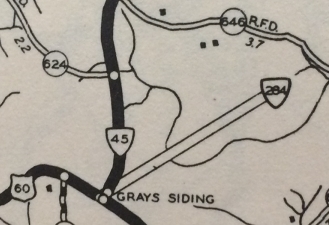 Starting with the 1957 Official, US 60 is again shown as multilane from Diamond Springs Rd to Pleasure House Rd. In 1958, US 60 was widened for about a mile east of Pleasure House Rd. In 1959, US 60 was multilaned from Buena Vista about halfway to Lexington; also, US 60 was widened west to Midlothian. 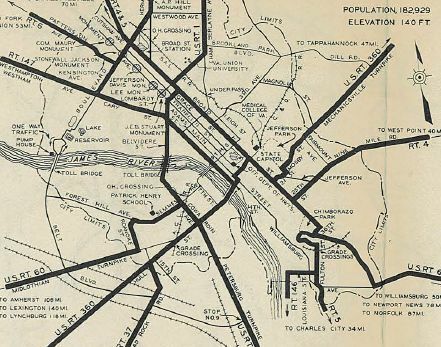 In 1960 or 1961, US 60 was multilaned on about half of its Semmes Av route (the western part with Forest Hills is still not shown as multilane on officials but it is 4-lane undivided) and the 1961 Official is the first to show the US 1 duplex north of James River and Broad St as multilaned; also, US 60 was multilaned from Lightfoot to US 60-Z; US 60 was widened on its VA 5 Williamsburg duplex; US 60 was widened from VA 152 north to Nettles Rd; US 60 was widened across Lynnhaven inlet to Old Great Neck Rd. In 1962, US 60 was widened from Norge to Lightfoot. In 1964, US 60 was widended from Old Great Neck Rd east to about a mile east of VA 343. In 1967, US 60 was 4-laned by being put on I-64 from WV to Exit 7. In 1968, US 60 was widened fully from Lexington to Buena Vista; also it was widened from Norge to VA 30. In 1970, US 60 was widened from Midlothian to SR 622 Flat Rock and also in the vicinity of the Richmond Airport near Sandston. In 1971, US 60 was multilaned by virtue of being on I-64 from Exit 7 to Exit 10; also US 60 widened from SR 622 Flat Rock to VA 300 Powhatan; US 60 was widened on the rest of the Fort Story Bypass. In 1972, US 60 was widened when added to I-64 around Clifton Forge. The 1975 and 1976 Officials erroneously shows US 60 as widened further west in Powhatan County to SR 629. In 1975, US 60 was multilaned on Warwick Blvd north to a little past VA 173. In 1976, US 60 was put on one-way splits in Newport News, making it multilane. However even today maps do not show this. In 1978, US 60 was 4-laned from US 15 west most of the way to Buckingham CH. 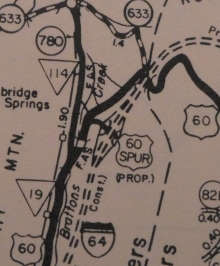 In 1980, US 60 was multilaned when it was added on I-64 between Clifton Forge and VA 42; also US 60 was widened on its new alignment from Seven Springs to a little east of the VA 156 SB split. In 1981, US 60 was widened from Cumberland CH west to the VA 45 SB split; also US 60 is shown widened from VA 162 west of Williamsburg to VA 132 - I believe the rest of the bypass was widened then as well, though even the 2008 Official still shows as 2-lane. In 1984, US 60 was multilaned when it was added to I-64 between VA 42 and Kerrs Creek. The 1984-85 Official finally shows US 60 as not widened between Busch Gardens and Carters Grove. In 1988, US 60 was widened from Sandston west past Laburnum Ave; also US 60 was 4-laned from the VA 173 area to VA 105. When US 60 was moved to all Main St in Richmond, that made Us 60 multilane on a stretch it had not been on Broad St. There are significant segments of 6+ lanes on US 60 in Newport News north of US 17-258 and also in Chesterfield County roughly from VA 147 to VA 161. Posted: Fully posted; As of 2008 cutouts remain in Covingon, Clifton Forge and west of Lexington. 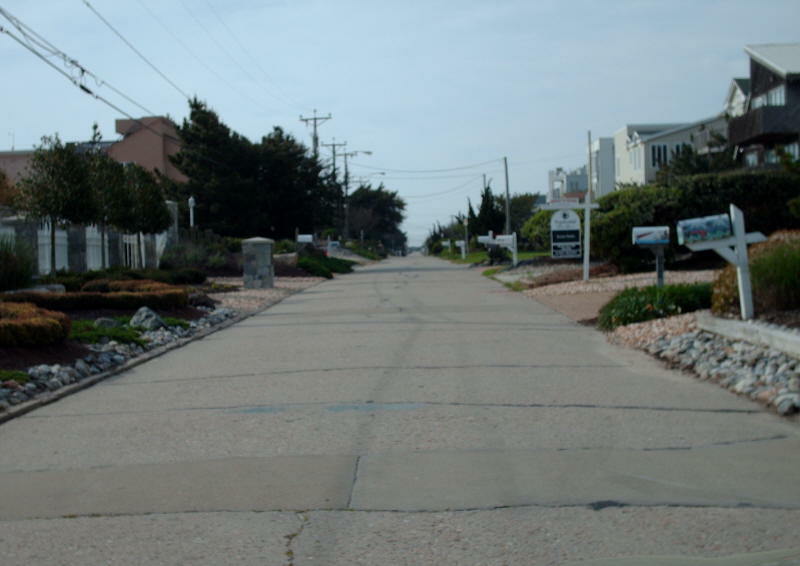 Posting of US 60 in the oceanfront area of Virginia Beach is nearly non-existent. There is an EB reassurance shield near 35th St and at the north end of Pacific Ave/44th St there are US 60 shields. Otherwise that is it. There is an erroneous US 60 END shield on General Booth Blvd just south of the Rudee Inlet Bridge which appeared in 2004. Reports are that a similar shield in that location was present in the 1970s. Error black-and-white I-60 shields exist at VA 168 and at 1st View St in Ocean View; error VA 60 shield exists approaching VA 5 east of Williamsburg. Truck Route: A Truck US 60 is posted in both directions in Richmond along Midlothian Pike east of Roanoke Ave (where US 60 turns north) to Hull St, where it follows US 360 across the James River and meets back up again with US 60. The point is to eliminate tight left turns on the mainline US 60. Comment: The logical precursor to I-64 in VA (even though 64 follows US 250 more closely between Richmond and Staunton). US 60 today is not a major route even where it is nowhere near I-64. That privilege went to its earliest routing, current US 360-460. US 60 from Buena Vista to Powhatan passes through some empty space in Central Virginia. It is very quiet, but does have scenic value. From Doug Smith I learned that from the 1930's to the 1970's, a marker for the end of the Daniel Boone Trail (national predecessor to US 60) sat near the US 58-60 jct. Creation: Appeared sometime after 1975 (per Alleghany County map) when US 60 was placed on I-64 around the north side of Clifton Forge. This is the 2nd US 60 Business. Adjustments: It appears US 60-220 was put on one-way splits in Clifton Forge in 1972. In summer 2011, US 60-220 Bus was returned to two-way traffic through downtown. Ridgeway St became US 60 Business TRUCK. Improvements: Paved upon inception; Multilane from Clifton Forge west, likely since inception. Posted: Fully posted although BUSINESS banners are missing in many locations; numerous cutouts remain as of 2011. Truck Route: A US 60 Business TRUCK route was posted along Ridgeway St starting in summer 2011 over what had been US 60 Bus WB through the downtown area. 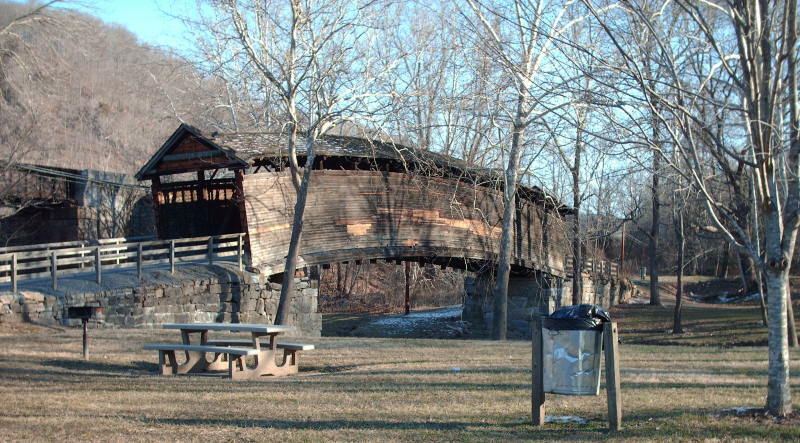 Comment: Clifton Forge reverted from an independent city back to incorporated town in the early 2000s. 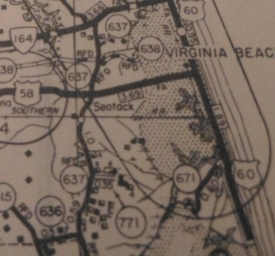 US 60 Business #1: Appeared in May 1958 (CTB) as a renumbering of mainline US 60 along the Virginia Beach oceanfront. It ran on Atlantic Avenue from 17th to 44th where Atlantic and Pacific Avenues came together. It had been intended to put US 60 on one-way splits using Atlantic and Pacific but the Virginia Beach City Council requested Pacific be two-way traffic and that because of Business interests tied to the use of the 60 designation to call Atlantic Avenue 60 Business. The CTB stated explicitly in the May 1958, April 1960, and October 1963 minutes that US 60 Business was not a primary extension and did not receive primary money. Dale Sanderson reports that others told him the route was still posted with cutouts into the 1970s. However, by the time I moved to Virginia Beach in 1991, there were no 60 Business postings. Only a solitary US 58 cutout on Atlantic SB and a US 60 cutout on Pacific NB at Atlantic were the only indications of a primary route ever having been there. I have yet to see a map label this US 60 Business. I also have never seen any CTB documentation decommissioning the route, although perhaps in their eyes it was never commissioned to start with. Given the horrific lack of posting of US 60 in the oceanfront area, it is not knowable whether US 60 Business exists or not. Creation: Appeared August 2004. Ran as it does today. This is the 3rd US 60 ALT. Posted: Posted from US 60 WB at US 460 and also on US 460 at the ramp to VA 168 NB. Not posted at all eastbound. Comment: This appears to be a part of the effort to move US 60 westbound traffic to I-64 via 4th view, as left turns from US 60 onto 4th View are no longer permitted. US 60 ALT #1: Mentioned as early as July 1938 (CTB), running on Virginia Ave (now Warwick) from 34th to 25th then east on 25th to Jefferson. US 60 ALT was renumbered as mainline US 60 in Sept 1961 (CTB). The only Official map to show this explicitly was ironically enough the 1961 issue. It is in the 1958 VDOT County Atlas and erroneously shown on the 1963 Esso map of Hampton Roads. US 60 ALT #2: Appeared August 1941 (CTB) as an upgrade to SRs 600 and 662. Ran from US 60 (now VA 159) Callaghan west to the West Virginia Line. US 60 ALT was renumbered as mainline US 60 in Oct 1947 (CTB). Today it is SR 661 and some F-routes along I-64 west of Callaghan. The only official showing US 60 ALT #1. US 60 SPUR: Appears on Rockbridge County maps from at least 1969-75 as a connector from I-64 Exit 43 to US 60. As best I can tell, when I-64 was opened through here, US 60 SPUR was signed as SR 780 as US 60 was moved onto I-64. US 60-Y: Appeared in July 1933 as a renumbering of VA 39-Y running as a loop off US 60 a little south of US 17 near Newport News, using Huntington Ave down to 50th St. and over to Warwick Blvd. In 1975, US 60-Y became the US 60 eastbound routing of a one-way split. US 60-Y was shown explicitly on Official maps from 1944 forward and was shown but not labeled back to it creation. US 60-Z: Appeared in December 1934 as a renumbering of US 60 through Williamsburg. initially it ran along Richmond Rd (old VA 162 endpoint) straight to central Williamsburg, then Duke of Gloucester St east then south around the Old Capitol using Blair, Francis and Waller Sts to York St east out of town. It appears that in July 1940 (CTB) US 60-Z was rerouted off Duke of Gloucester St to instead use France St and Francis St. In 1974, US 60-Z became VA 132 west of central Williamsburg (then later VA 162 but now unnumbered) and the multiplexed routes of VA 5 and VA 31 (now just VA 5). 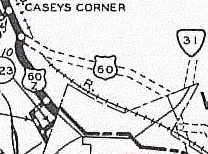 US 60-Z didn't appear on Officials until 1958 but did appear on the 1936 James City County Map. US 60-Z avoids Duke of Gloucester St.